The performance runs two hours including two ten minute intermissions. This is the hilarious story of a theater group trying desperately to put on a play (Murder Most Foul) in spite of maddening interference from a haughty authoress who keeps revising the script. Act I is a rehearsal of the dreadful show; Act II is the near disastrous dress rehearsal, and the final act is the actual performance in which anything that can go wrong does. 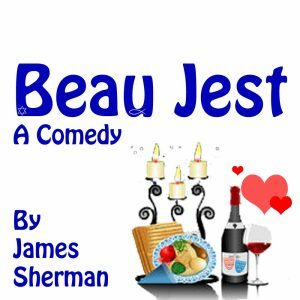 This hilarious and heartfelt play both skewers and pays homage to the romantic comedy genre. Mark is a nice guy who never gets the girl, while Ally can’t seem to shake the world’s worst boyfriend. Both have built their romantic ideals on Disney heroes, fairy tales, and Cameron Crowe movies. They’re perfect for each other, but there’s just one problem: they’ve never met. As we follow their overlapping lives, we see all the ways these two are true soulmates, and wait for the moment they will find each other… if they find each other. Mark and Ally are made for each other, but they just can’t seem to find one another. 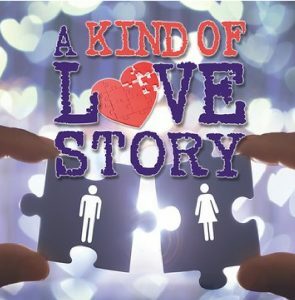 A Kind of Love Story tells their love story over several chapters, overseen by an omniscient narrator who tells us all about the two. Mark is stuck on the girl that got away: his best friend’s wife, Diane. Ally can’t seem to shake her terrible boyfriend, Max, who won’t commit. At several points, we think Mark and Ally will connect— Mark’s co-worker Lucy suggests he go out with her roommate (who we later learn is Ally). The two connect online, but their planned meeting is thwarted. Though they never speak, a chance encounter in a movie theater urges them both to take charge of their lives… and might finally lead them to one another. It’s a Wonderful Life – A Live Radio Play has become a holiday tradition at Oil Lamp – a tradition that audiences embrace enthusiastically as they’re swept up in the magic and whimsy of this timeless classic. Only seven actors bring the dozens of characters to life in a 1946 radio play — complete with sound effects – that tells the story of George Bailey, a young man whose troubles lead him to wish he’d never been born. He is visited by the angel Clarence who comes to earth on Christmas Eve to help George realize how many lives he has touched, just how blessed he has been, and how different the world would be if he’d never been there. 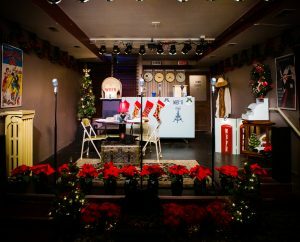 Oil Lamp Executive Director Keith Gerth again transforms the intimate Glenview theater space into the studio of New York radio station WBFR on Christmas Eve in 1946 for this warmhearted adaptation of the famous Jimmy Stewart and Donna Reed film. But at Oil Lamp Theater, the magic isn’t only on the stage! Audiences will be captured by the tinsel-and-holly enchantment of a traditional Christmas from the moment they enter the theater. The tree is up in the lobby, holiday music is playing, a miniature train is chugging away… and of course, complimentary cookies, nuts, candy and hot chocolate are available for all! Group rates available – contact box office at 847.834.0738.